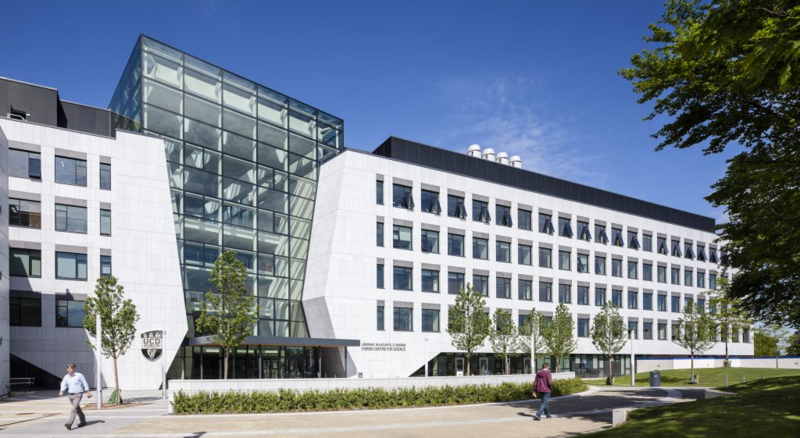 Prof. Scott A. Hughes is currently visiting the Relativity group at UCD as part of the university’s visiting professor programme. 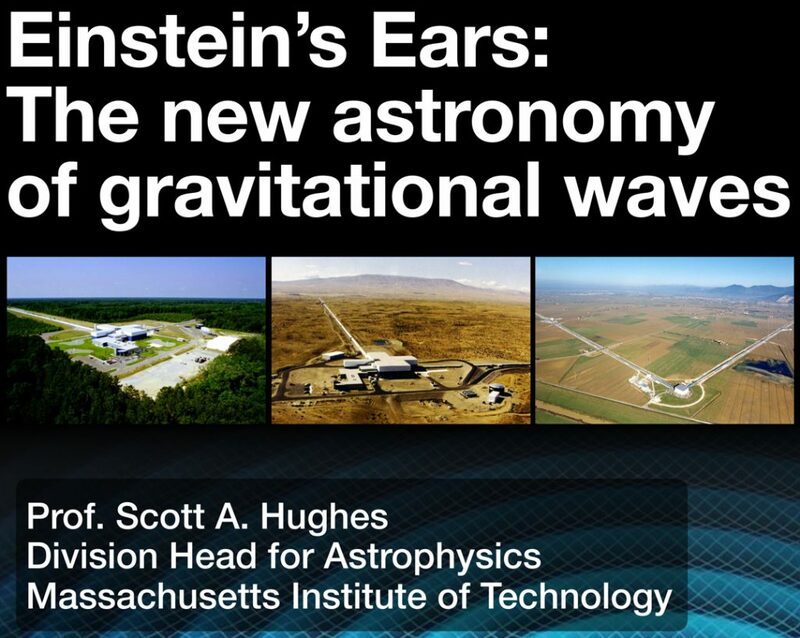 During his visit, Prof. Hughes will give a public talk on the exciting new science made possible by the advent of gravitational wave astronomy. Prof. Hughes is a highly engaging public speaker and I strongly encourage anyone interested in gravitational waves to addend. Attendance is free but we request that you must register on eventbrite for a ticket if you plan to come. 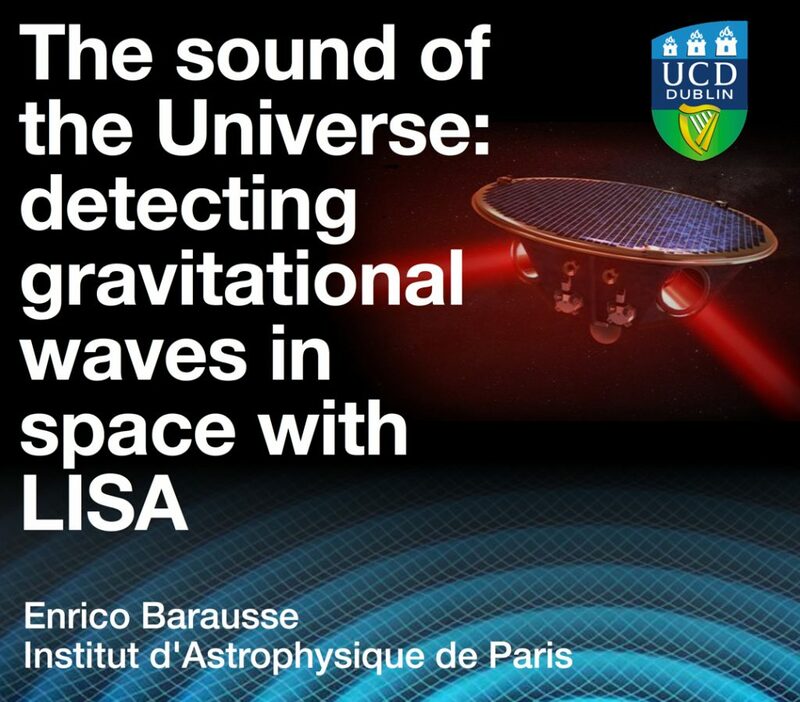 As part of the Irish Quantum Foundations 2017 conference being held at UCD on May 25-26, there will be a public talk by Dr. Enrico Barausse about the exciting prospect of observing gravitational waves in space. Attendance is free but you must register on eventbrite for a ticket. 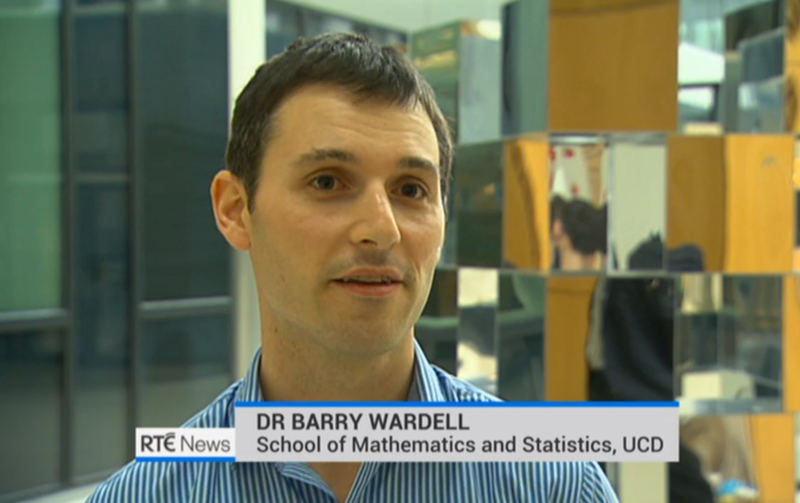 With all of the excitement surrounding yesterday’s LIGO announcement, RTE News decided to come out to UCD and interview our group to get our impressions. I was delighted to see a clip from my interview make it onto the evening news, and also into an article on the RTE website. Yesterday was an incredibly exciting day for everyone in the gravitational physics community. After months of rumours, the LIGO collaboration made the spectacular announcement that they have achieved the first ever direct detection of gravitational waves. It’s difficult to put into words the enormity of their accomplishment. It’s a shoo-in for a Nobel prize (probably for LIGO’s three founders Kip Thorne, Ronald Drever and Rai Weiss) and has been widely heralded as one of the biggest scientific breakthroughs of our time. As if that wasn’t enough, the gravitational waves – which were detected by both LIGO detectors on September 14, 2015 at 09:51 UTC – were generated over a billion years ago by the merger of a binary black hole system. So in one go the discovery has made two huge scientific breakthroughs: it has confirmed Einstein’s prediction that gravitational waves exist and can be detected on Earth; and it has confirmed that black holes exist and can appear in binary pairs. 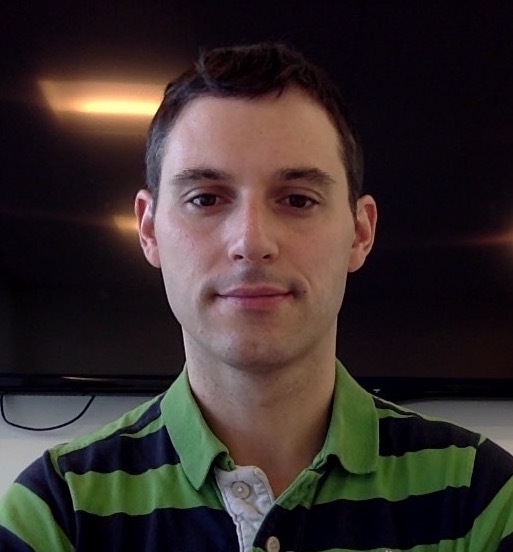 It was particularly impressive that the announcement came along with the simultaneous publication of a peer-reviewed paper in Physical Review Letters (also on arXiv), along with 12 other papers giving all of the nitty–gritty technical details and a full release of the data from the detection, which has been given the name GW150914. The real excitement now is what’s next. Detecting gravitational waves was just the start; as LIGO continues to collect data and its sensitivity is improved we can expect to see gravitational waves from a whole host of other sources including binary neutron stars, supernovae and relic gravitational waves from the first instants after the big bang. Looking further into the future, the next grand challenge will be to take gravitational-wave detection into space, where it is unaffected by the low-frequency noise encountered on the Earth. We have already made the first steps towards this challenging goal: the LISA pathfinder technology demonstrator mission was recently launched into space and is set to begin tests within the next few weeks. This will be followed up by the European Space Agency’s eLISA mission, which will take three LIGO-like interferometers, scale the arm lengths up from 4km to several million kilometres, and launch them into space. The mission will open gravitational wave astronomy up to a whole host of new sources including super-massive black hole binaries and extreme-mass-ratio inspirals. movies produced by the SXS collaboration using numerical relativity simulations. We compare the science capabilities of different eLISA mission designs, including four-link (two-arm) and six-link (three-arm) configurations with different arm lengths, low-frequency noise sensitivities and mission durations. For each of these configurations we consider a few representative massive black hole formation scenarios. These scenarios are chosen to explore two physical mechanisms that greatly affect eLISA rates, namely (i) black hole seeding, and (ii) the delays between the merger of two galaxies and the merger of the black holes hosted by those galaxies. We assess the eLISA parameter estimation accuracy using a Fisher matrix analysis with spin-precessing, inspiral-only waveforms. We quantify the information present in the merger and ringdown by rescaling the inspiral-only Fisher matrix estimates using the signal-to-noise ratio from non-precessing inspiral-merger-ringdown phenomenological waveforms, and from a reduced set of precessing numerical relativity/post-Newtonian hybrid waveforms. We find that all of the eLISA configurations considered in our study should detect some massive black hole binaries. However, configurations with six links and better low-frequency noise will provide much more information on the origin of black holes at high redshifts and on their accretion history, and they may allow the identification of electromagnetic counterparts to massive black hole mergers. 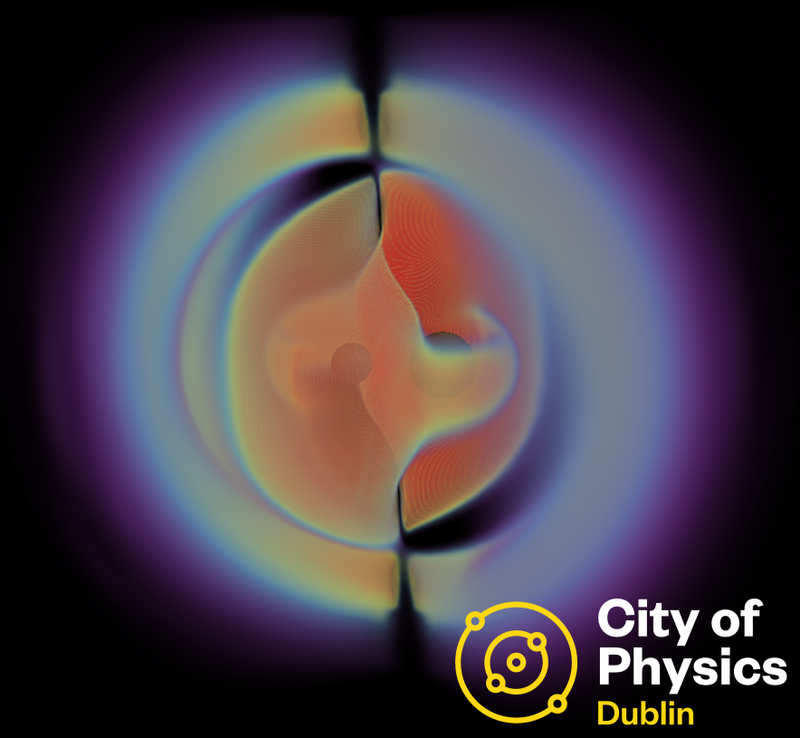 Throughout November, the City of Physics project is gathering scientists, artists and designers together to bring physics to every corner of Dublin city. There has been a live projection of the sun, physics-themed talks, physics-themed stand-up comedy, a physics-themed ad campaign, and more to come. There’s also a blog with daily posts covering all sorts of scenarios where physics appears. I had the privilege of writing a blog entry, and it has appeared as today’s post. My office mate Sarp Akcay recently gave a nice public talk on “Black Holes: from a mathematical curiosity to Hollywood blockbuster” as part of the Pint of Science festival. Check it out to get an idea of the kind of research our group is interested in. With a view to developing a formalism that will be applicable at second perturbative order, we devise a new practical scheme for computing the gravitational self-force experienced by a point mass moving in a curved background spacetime. Our method works in the frequency domain and employs the effective-source approach, in which a distributional source for the retarded metric perturbation is replaced with an effective source for a certain regularized self-field. A key ingredient of the calculation is the analytic determination of an appropriate puncture field from which the effective source and regularized residual field can be calculated. In addition to its application in our effective-source method, we also show how this puncture field can be used to derive tensor-harmonic mode-sum regularization parameters that improve the efficiency of the traditional mode-sum procedure. To demonstrate the method, we calculate the first-order-in-the-mass-ratio self-force and redshift invariant for a point mass on a circular orbit in Schwarzschild spacetime. Update: The paper has now been published as Phys. Rev. D92, 084019 (2015). We extend the gravitational self-force methodology to identify and compute new tidal invariants for a compact body of mass on a quasi-circular orbit about a black hole of mass . In the octupolar sector we find seven new degrees of freedom, made up of 3+3 conservative/dissipative `electric’ invariants and 3+1 `magnetic’ invariants, satisfying 1+1 and 1+0 trace conditions. After formulating for equatorial circular orbits on Kerr spacetime, we calculate explicitly for Schwarzschild spacetime. We employ both Lorenz gauge and Regge-Wheeler gauge numerical codes, and the functional series method of Mano, Suzuki and Takasugi. We present (i) highly-accurate numerical data and (ii) high-order analytical post-Newtonian expansions. We demonstrate consistency between numerical and analytic results, and prior work. We explore the application of these invariants in effective one-body models, and binary black hole initial-data formulations, and conclude with a discussion of future work. Update: The paper has now been published as Phys. Rev. D 92, 123008 (2015).